The conflict between the humans and the snakes is quite ancient with sometimes us becoming the victim while at other times, it is the snake. In short, we and the snakes can never live together in one space. So it is always preferable to avoid such conflicting situations. And, in order to do that, you can always take the help of the natural remedies that acts like a good snake repellents. Of course, there are many commercial chemical-based products available in the market to kill snakes but I always prefer to use techniques that will keep them away from your home and not things that can take their lives. After all, they attack you only if they are threatened by you and in most cases, they are non-venomous. So, why kill innocent, instead use the tricks so that they do not even come near your home and garden. Another more important reason why I do not like the commercial products is because they are chemicals which can also have harmful side effects on humans. Starting from allergies to breathing troubles to long term health complications, there can be several adverse outcomes if you are exposed to such chemicals. So, it is better to avoid them and use the natural hacks to keep snakes away from your home and garden. Your home is the safest place on Earth but with snakes around, your existence will not be safe. Even if they are non-venomous, the very fear of them getting near your home or even entering inside your home can take the peace out of your life. So, if you often spot snakes in and around your home and garden, then here’s how you can keep snakes out of your home and garden easily. The first thing that I am going to recommend you is to keep your garden as clean and uncluttered as possible. This is very much needed because a dirty garden full of tall grasses, stacks of junk, brush piles etc. will become the natural habitat for the mice, rats and other insects which fall in the list of favorite foods for the big snakes. So, if you want to eliminate the fear of snakes coming in or around your house and garden, then make sure to keep it clean and organized. The garden has to be well organized with no junks out there and trees and bushes properly pruned. Also, if your garden is unclean and messy, it will be hard for you to spot the snakes and then you may accidentally come close to it and end up being attacked. Moreover, besides the problem of snakes, it is nice to see a good well-maintained garden in front/back of the home. So, please do take a little effort and utilize your gardening skills. However, if you are bad in gardening and wondering how you can get things done easily, then here’s a detailed post on garden maintenance that you may like to check. Common pests can invite snakes to your garden and may be home and hence it is seriously important to get rid of pests to keep snakes away. Apart from being unhygienic, pests can easily invite snakes inside your garden and home. So, make sure that you keep your home very clean and use the natural disinfectants and other tricks to keep your home pest free. And, if none of your natural means are working in favor of you, please do not hesitate to call pest exterminators for help. Well, you might have to spend a few bucks for pest control, but I think it is far better than living in a home with pests and snakes around. Snakes love to stay in cool and damp places so it is very essential for you to keep your home and the areas surrounding it dry. The inside of the home you can control the temperature by turning on your air conditioner time to time and then by sealing all the water leaks. As far as the places around your home are concerned, you need to be careful with them. It is advisable that you do proper investigation of your home and if you see drainage issues, fix them fast. Then trim the shrubs, removes all of the remains of the last years leaves and also see to it that there are no sources of standing water like slow draining flower pots, bird baths etc. In short, you will have to eliminate all water sources and allow entry of sunlight in order to keep the surrounding area dry and that may help in keeping snakes away from your house and garden. Make sure that all of the entry points are sealed in order to not let the snakes enter into your home. This is really important and it is advisable that you check your home properly and do that ASAP. Snakes are really good in fitting themselves perfectly into tight spots so you need to seal even the smallest holes and cracks. Also, check for all of the drains and the vents in the kitchen, bathroom, HVAC etc. and cover them with screens otherwise they could become the potential entry points for the snakes. If there are specific areas where you want to avoid the entry of the snakes like flower beds, vegetable garden etc., then you can get it done by mulching up all of the sharp materials like rocks chips, pine cones, rose bush clippings, egg shells etc. This is because these items will make it very uncomfortable for the snakes to slither over and hence, they will avoid going that way. Naphthalene is a good snake repellant that can help you to keep snakes away from your home and garden easily. Place them at important places in and around your home from where the snakes might enter. You may even keep them in a porch. This method is very effective for preventing the entry of snakes in the garden and home. However, the only problem with this is that the smell of the naphthalene is quite pungent and will linger around for a long time. If you are OK with that, then go for it. Most of us use garlic and onions on a daily basis and so I am sure you can easily use them as snake repellants. The reason why they are so effective is because the mixture of garlic and onion generates sulfonic acid which makes the humans cry but for the snakes, it is something which completely puts them off. So, you can definitely give is a try and it’ll help you to keep snakes away from your house and garden. You can make garlic repellant as well by mixing it with the rock salt and then using it to mark the perimeter around your home making it very difficult and unfavorable for the snakes to cross the boundary. You may even spray garlic oil in areas and make the environment around your home unfavorable for the snakes to create a habitat. Vinegar is another important ingredient in your home because not only does it help in keeping your home clean but it is also one of the recommended ingredients that can help you to keep the snakes out of your home. All you need to do is to pour some white vinegar around your home and also around your pool area. This will work because the body of the snakes usually absorbs liquids, so they will find it really hard to slither over the vinegar. You can make a natural snake repellant using lime mixed with peppermint or hot pepper and then pour it into the perimeter around your complex. Snakes hate the smell and the fumes causes itchiness on their skin, so they will not try to come near your home. The next remedy to keep snakes away from your house and garden is to use a blend of the cinnamon and the clove oil. This trick has been in use for quite a long time to repel snakes as when it is sprayed on a snake, it immediately flees. So, for the benefits, you can take a spray bottle and pour a mixture of cinnamon and clove oil in it and then spray the mixture in all the nooks and the corners of your home. 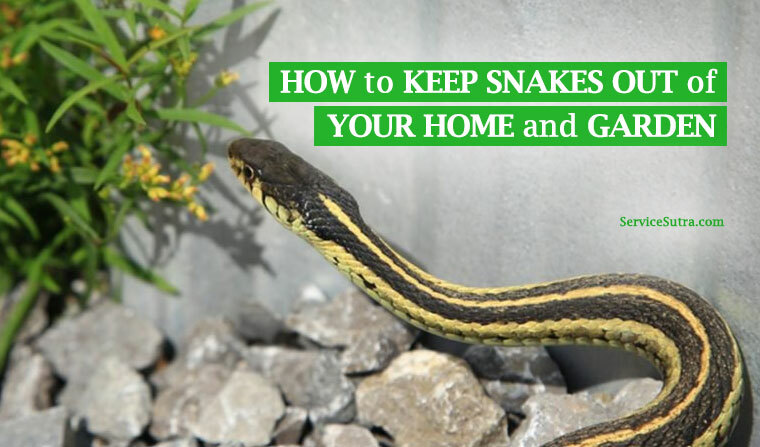 Although it is a short-term solution, but it usually work well and hence you may like to try this remedy to keep snakes away from house and garden. There are some plants which repel the snakes, so you can definitely consider planting them in your garden. These plants will not kill the snakes but will definitely create an unfavorable and uncomfortable environment for them which will automatically make them shift to some other place. Listed below are a few of such plants. West Indian Lemon grass- This plant is helpful for repelling the snakes because it has a citrus scent which the snakes absolutely hate. So, plant it in your garden. There is not much to do in maintaining it. You just have to water it time to time. Tulbaghia Violacea- If you live in hot climate, then it is easy for you to go for this plant as it survives in hot temperatures. Snakes do not like the smell of it so you can easily keep it inside your home or out in the yard to get rid of the snakes. Moreover, this plant is quite useful in curing cold and coughs so keeping it is doubly advantageous for you. Mugwort- Often known as the wormwood due to its wooden roots, this plant makes the snakes very uncomfortable so you can definitely take the help of it. Snakes are not at all welcomed inside or around your home. After all they pose a lot of threat not just for you but for the pet birds and chickens as well. So, you should try out ways to avoid the entry of them near your home. Obviously market based products are available but they themselves are harmful for your health, so it is best to try out other ways that are natural and safer. I have already given some easy to apply tips on how to keep snakes out of your home and garden. I am sure these remedies will work in repelling snakes from your home and garden and you will be able to avoid frequent encounters with the snake around your home. I have myself used some of these hacks and trust me, they work. Now, it is your turn to try and see the results for yourself. Do let me know your feedbacks regarding it after using them and if you know any other natural tricks or hacks to keep snakes out of home, then do let us know by commenting below. And finally, if you liked this post, please share it with others so that others also get to know about the methods to drive snakes away from their homes. Until then, stay safe and do not let the snakes come inside or around your home.